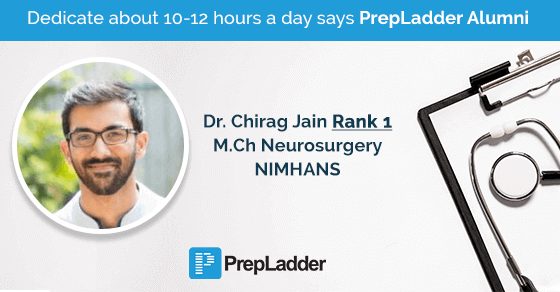 PrepLadder congratulates Dr. Chirag Jain on securing Rank 1 (Neurosurgery) in NIMHANS 2018 exam. We wish him all the best for his career and future ahead. In this exclusive interview with PrepLadder, he shares the plan that worked for him to help you achieve your dream PG seat. Hi. I am Chirag Jain. I graduated from Bangalore Medical College and Research Institute and I’ve secured Rank 1 in M.Ch Neurosurgery in the NIMHANS entrance exam. What do you think is the correct approach to study for NIMHANS? Only MCQ's or Theory+ MCQ's? The NIMHANS exam is a bit different than the other PG entrance examinations. I feel that it’s an exam which really tests your basics and your core concepts. And if you’ve studied the pre-clinical and para-clinical subjects well, you can score easily in this exam. Keeping that in mind, I’d think that Theory is very important for basic subjects, especially Anatomy, Physiology and Biochemistry, combined with a good question bank that can test your knowledge. The same applies to second year subjects. Regarding the other subjects, the emphasis on these should be lesser and one can do a basic prep for these and solve standard MCQs. Also, keep in mind that MCQs won’t help you as much as a solid foundation in core concepts will. They are there to test your knowledge, not provide that knowledge. NIMHANS is easily the best test to prepare for, because it happens about 3 months after NEET and about 4-5 months after November exams. By this time, I assume that one’s basic preparation in all subjects might be done and one can start concentrating on the pre-clinical and para-clinical subjects in Feb and March. The pattern of the exam is Common paper (70 question from all subjects) +/- Neurology (30 questions) +/- Neurosurgery (30 questions) +/- Psychiatry (30 questions). You can choose which fields you want to apply to. Please don’t get scared by the neurology and neurosurgery questions. There won’t be any questions from the actual specialties. These questions will be from the basic sciences as well, such as Neuroanatomy, Neurophysiology, Neuropathology and such. If one is preparing just for NIMHANS, I think a dedicated 5-6 months of prep shall suffice. This is the hardest question for me to answer, because there are subjects that I’ve never touched. Since my preparation was dedicated to AIIMS, I wanted a strong foundation in my basic subjects and tried my best to read standard books for these. There are lots of online resources which I feel are quite useful as well. *click on the name of book to directly buy it from PrepStore at the best price. Pharmacology - Class notes + Review of Pharmacology by Gobind and Sparsh. Ophthalmology - Barely touched. I do recommend an extensive review of Neuro-ophthalmology and Squint, for which I read Kanski. Medicine - This is always going to be a problem. Get your pathology and pharmacology down well and solve some MCQs. There’s no useful book for this subject. Thankfully, my concepts were clear from reading Oxford Textbook of Medicine in Final Year of MBBS. Surgery - Barely touched. I had clear concepts from reading Sabiston Textbook of Surgery in Final Year of MBBS. OBG - Barely Touched. William’s Obestetrics and Berek and Novak’s Gynecology in Final Year. Paediatrics - Did not study at all. As you can see, my approach was heavily dedicated towards getting my basic subjects to a 100%. This approach won’t work for everyone. Please figure out your strengths and weaknesses and tune it accordingly. If you’re someone who has never read a standard book, don’t worry, the basic concepts can still be found in MCQ books, you’ll just have to put in a bit of extra effort. I was not prepared for any of these exams. I just wrote them for the experience that it would provide. I hadn’t done many subjects and I was genuinely concerned that my ranks would be terrible. But what I discovered was that a strong foundation in concepts helps for these exams also. One can solve many fact-based questions if one can reason out all the options. Thus, please concentrate on concepts and you’ll do better than anyone else. How big is the role of practice and revision while preparing for NIMHANS and how much time should be dedicated for it? Honestly, I am ill equipped to answer this question. I did not ever dedicate any time to revision while preparing for NIMHANS, because my strategy involved understanding concepts. Once I’ve understood something, I can remember it for a very long time. There are some facts and formulas that one needs to remember, and I think these can be noted separately and revised the week before the exam. Yes. PrepLadder definitely played a role in my success. I would use the subject tests after I’d finished reading a subject to evaluate my understanding of the subject and I’d always find some questions that I could not answer that helped broaden my understanding. The grand tests were useful as well. One should take these regularly to evaluate how they are progressing overall. Don’t be scared about taking these if you haven’t finished all subjects. The point is to learn from your mistakes. I made multiple and I tried to stick to all of them. We all know that nobody can stick to a timetable. The point is that timetables can help you measure your progress and can motivate you to push yourself if you’re lagging behind. Also remember to constantly adapt your timetable to your needs, depending on which subjects need more attention. I can say that I was both. I’ve got a gold medal in Biochemistry and I’ve almost failed in Anatomy. I’ve made a lot of mistakes along the way and learned from all of them. The subject that I found the hardest to read and that I gave up on multiple times was Microbiology. I just couldn’t get myself to memorize what I thought were pointless facts. The easiest one was Physiology, it just made sense to me. One mistake that you believe everyone must avoid while preparing for NIMHANS. Do not overextend yourself. NIMHANS is one institution that believes in asking questions which actually test your foundation. Concentrate on that. Do not try to learn random facts and MCQs that were asked in tests like NEET. Work on your basics and success shall be yours. What was your exam taking strategy? How many questions did you attempt in NIMHANS? My strategy was to be incredibly relaxed on the day of the exam. That’s how I’ve taken all my exams. One should not read anything on the day of the exam, and if possible even on the day before the exam. Spend time watching TV or with your loved ones and relax. If you’ve prepared well, your brain will definitely do the rest in the exam. My plan was to answer almost all the questions, without regards for the negative marking (0.25). I answered 96/100 questions in the Common+ Neurology Paper and scored 81. I answered 30/30 questions in the Neurosurgery paper and scored 28. Please don’t be scared of negative marking. If you know anything at all about the question, do try to attempt it. I apologize for the long answers and I request everyone to take a deep breath and relax. From my personal experience, students tend to stress themselves out during this year beyond what is necessary and it becomes counterproductive. Please remember that this isn’t the end of the world. It’s a degree. Nothing is worth a panic attack. Try your best to stay calm and study regularly. Dedicate about 10-12 hours a day, not more. Find at least one other activity to indulge in, a physical activity would be best. Some days you are going to want to give up. Take a break on those days and do something fun, then come back. A couple of hours doing something fun followed by days of productivity is better than days of anguish where you’re not studying or having fun. Keep calm and try your best and you will definitely succeed. We thank Dr. Chirag Jain for sharing his success story and congratulate him on achieving such great results. To read success tips from Dr. Mahammad, Rank 1 Neurology NIMHANS, click here.